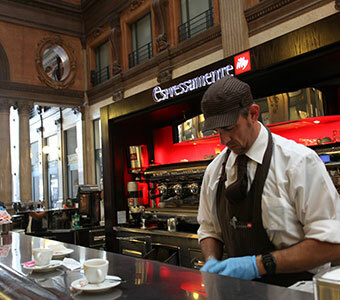 In Italy, you can find bars at every corner of the city as indispensable part of Italian´s daily life. Many people go to coffee bars several times a day; before going to work in the morning, for breakfast, during a break from work or study, to have a light meal, or to chat with friends bumped into on the street, etc. It´s said that there are as many as 150,000 bars in Italy, and almost all Italians have their favorite bar (in Italian “il mio bar”). A quick stop at the bar counter and drinking espresso in one gulp this is the genuine Italian style. Most coffee bars in Italy are run by local individuals, and they’re ideal places for all Italians who love coffee and talking. You can always find bars filled with Italians talking with a cup of coffee in hand. At a bar, they do not only serve “Caffè”, “Macchiato” or “Cappuccino” but also cocktails, “panini”, sweets, ice-cream, as well as gifts, etc. “Barista” is an Italian word that means someone who makes and serves coffee and coffee drinks (such as cappuccino) to customers. In Italy, the center of a “bar” (cafe) is the espresso machine, so the barista is identified with his ability to brew a great coffee. In our Barista Course, you will learn the necessary skills to be a barista in just 1 or 2 weeks. *The program above may be subject to change. *Italian language skill is essential. 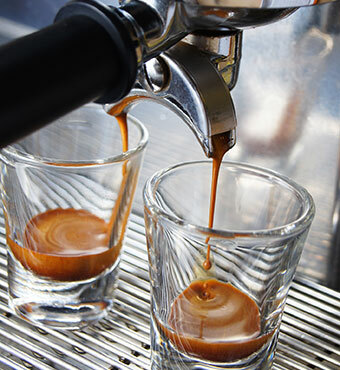 To be a barista in an Italian bar means that you communicate with the customers to understand how they want their coffee and also to enjoy small talks to make them feel at home, so it is necessary to have both coffee making techniques and conversation skills. Italian language skill is essential to build good relationships with the customers, so students will study Italian language for the first 3-6 months, and then start actual internship at an Italian bar. Working side by side with authentic baristas, you will brush up your skills as a barista, enrich the knowledge as a barista, and practice conversation with real customers. Those who do internship in bars with foreign visitors, knowledge of other languages such as English, Spanish, Chinese, etc. will be useful.